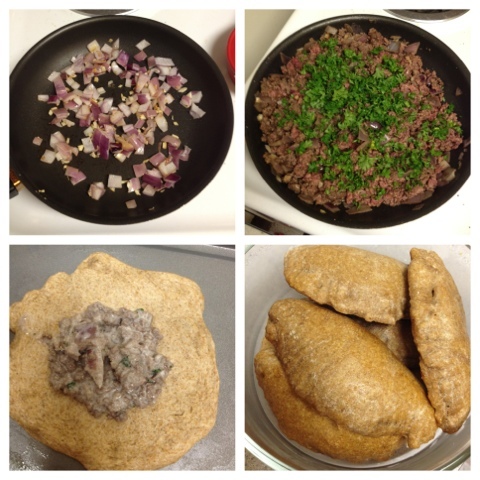 Yesterday I had a craving for meat pies and decided to make a healthy version at home. I love following recipes when I cook, but this was all cravings inspired. Enjoy! For the meat: Spray your skillet with Pam cooking spray and saute the garlic and onions until browned. Next, add the ground beef, cilantro, salt and pepper to taste, and any meat seasoning you'd like to add. I used a spice that is actually called 'meat seasoning' bought in Iran. If you go to the spices section in your grocery store, they have different meat seasoning packets you can buy by the company McCormick. Let the meat cook while continuously breaking it up until it is completely browned. Remove meat from the skillet and add a few spoon-fulls of Greek yogurt and a few tbs of lemon juice to taste. For the dough: Separate the dough into little balls and make 6 inch rounds with them. Put a spoon-full of the meat mixture in the middle and fold the dough over to create a pocket. Using a fork prick the edges together. Continue making the pockets with the rest of the dough and place them on a baking sheet sprayed with Pam cooking spray. Use a brush to brush a little egg white on top of each pocket. Set the oven to 400 degrees and let the pockets bake for about 20 minutes. I had a lot of ground beef left over that I saved to make other things with. You can get more dough to make more pockets or you can even make a regular pizza topped with the beef. This is my favorite store bought dough to use for cooking. It's great for making pizza or even strombolis. Add any type of sauce and toppings you'd like it's a great quick way to make a meal! 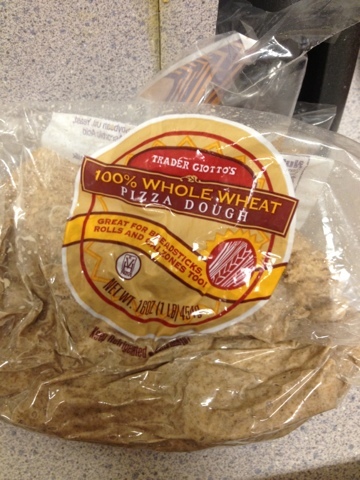 If you prefer white dough, Trader Joe's also has this in white.